Whether we start a knife with a stock removal method or hammer forge it to shape, every knife starts with profiling. This is where we establish the basic shape of the knife out of a piece of high carbon steel with known chemistry and metallurgical properties. Some knives are designed as we go, feeling out the lines and curves as they develop, and sometimes they start on a sketch pad, with very deliberate measurements and properties based on a customers request, or just some specific design element we want to execute on. Once the knife has been shaped, we start the process of establishing the geometry ahead of heat treatment. In every knife, the geometry does the cutting, so getting it right is of paramount importance. We also take any hammer forged knives through several thermal cycles to relieve any stresses, and start refining the grain structure ahead of the very stressful process of quenching (hardening). Hardening is the part of heat treatment that establishes a knife's limits, as well as it's every-day cutting potential. In this, we heat the steel up to what is called the critical temperature, at which point all the iron atoms in the steel open up their atomic linkages, allowing free carbon (as well as alloying elements) to diffuse into those newly open spaces. Then we cool it rapidly, typically in a quenching medium such as oil, and those iron molecules slam shut down around the carbon, taking the steel from a malleable and somewhat plastic state to a very hard, and brittle one. The next and final step in heat treatment for most knives is a set of temper cycles which dial back some of the hardness with low levels of heat that add toughness to the blade. This heat treatment, along with the final geometry of the blade, will establish the limits of the blade - its elastic and plastic deformation limits - or how much load it can take before failure. 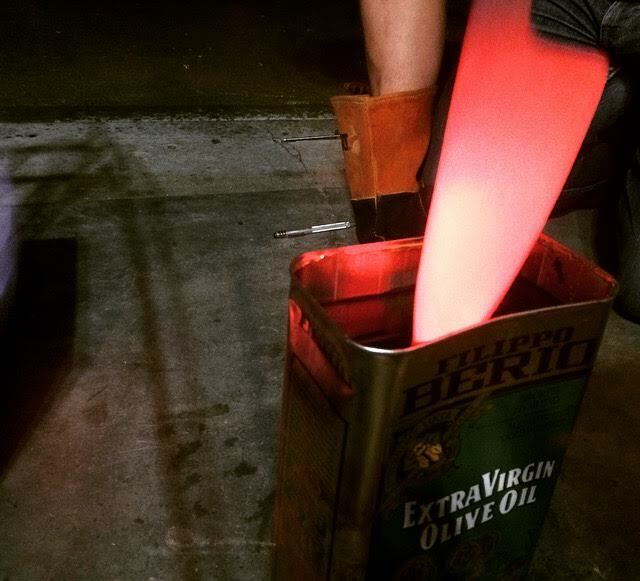 Once a knife has been properly heat treated, we finalize the geometry of the blade. We initially do this using a series powered abrasive belts, then finally dial in the geometry and clean up the scratch pattern by hand with finer and finer grits of sand paper and whetstones. Some knives are then given a forced patina with some sort of acidic solution, while others are left with clean, bright steel. Once the blade itself is basically finished, we start on the handles. How they are shaped and what they are made of depends on the order since they are custom works, but all are ultimately affixed to the tang of the blade using a very strong epoxy, and typically some sort of pin for added mechanical stability. Handles are typically finished the same way the blades are: first using abrasive belts, then finished by hand until the desired feel and lustre is achieved. The final two steps are to electrochemically etch our logo onto the blade, then to hand sharpen using whetstones. Each knife is then tested, and a light coat of our handle butter is applied to shine up the handle before leaving our shop.